Here's guide of how to free download 720p/1080p HD MP4 Super Bowl commercials 2019. Super Bowl LIII (2019) will arrive on February 3, 2019, which will determine the champion of the NFL for the 2018 season between American Football Conference and National Football Conference. Apart from the excellent game, ingenious commercials during Super Bowl LIII airtime not only relax audiences but bring some fun, some emotions or some new feelings. Well, you may need to free download online 2019 Super Bowl commercials for later playback, further using in your home-made video or learn something from those great works. In this article, we will lead you to save Super Bowl commercials in (1080P) HD MP4 offline via a great online video downloader. How to Free Download (2019) Super Bowl Commercials? WinX YouTube Downloader – Free download (2019) Super Bowl commericals, full match, half-time show and other Super Bowl related videos, sports videos in (1080P) HD MP4 from 300+ sites at a superfast speed. For someone who may be an advertising planner intending to grab inspiration or skills from Super Bowl commercials, or just a viewer loves those stunning ads hoping to collect them together, it is suggested to free download (2019) Super Bowl commercials in order to study or watch those excellent ads avoiding long-time loading and various errors. WinX YouTube Downloader is such a perfect program available to free download Super Bowl commercials and any other great sports commercials (for example Nike Football), music videos, hot movies etc, in 360p SD, 720p/1080p HD, 4K/8K/3D (if there is a source) from YouTube, Dailymotion, Vimeo, Metacafe and more (600+) in flash. It is harmless to your computer for no adware/spyware/virus bundled. First of all, please download and install WinX YouTube Downloader on your Windows (10) computer. Next, follow the steps to free download Super Bowl 2019 commercial. Step 1. Click Add Url button after launching WinX YouTube Downloader. Step 2. Search your favorite Super Bowl commercial 2019 on YouTube or any suported sites. Click Paste URL & Analyze. Step 3. After the results are shown, select wanted one, for example 1920x1080 MP4. Next, click Download Selected Videos. If you would like to download several Super Bowl commercials or game videos at one time, repeat step 1, 2, 3 to add videos to the download list. Step 4. Click Browse button to set output folder (hard drive or device) and click Download now button to start downloading. After the download process is finished, the output folder saving downloaded Super Bowl commercial videos will pop up. You can play, edit or transfer those video files to iPhone, iPad, Android etc, for movable watching. 1. WinX YouTube Downloader is also available to download TV shows, music videos, sports and other videos in 4K/HD/SD/3D/VR with ease. 2. The software developer does not advocate downloading copy-protected videos for any commercial purpose and suggests referring to "Is it legal to download YouTube videos" before saving YouTube videos to computer. We expect more excellent ads showing in 2019 Super Bowl. Well, before that, let's take a look at 2018 best and worst Super Bowl commercials. And we will give an update if 2019 new rank is released. The statistics indicates that Super Bowl is one of the most watched American TV broadcasts leading to the fever of advertising during the game by prominent brands for example Budweiser, Pepsi, Bud Light or smaller brands for generating publicity and certainly carrying a high price of advertisement cost. At the beginning, Super Bowl commercials are only aired in the United States. 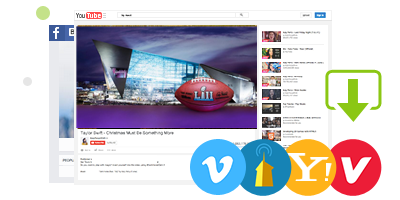 Gradually, advertisers upload their iconic Super Bowl ads to YouTube for sharing with globe viewers. Since 1970s, numerous commercials during Super Bowl game leave deep impression to viewers for high quality contents, hilarious storyline, great visual effect, celebrities and animals feature. For example, Budweiser, the beer brand, becomes the most successful advertiser for its notable Super Bowl ads featuring mascots Budweiser Clydesdales. * Free Download commercials, movies/TV shows, music videos, sports and any other kinds of videos in SD/HD/4K/8K/3D/VR from YouTube and other 1000+ sites in a flash. * Convert online/local videos to MP4 (H.264/HEVC), AVI, WMV, MOV, FLV, 3GP, iPhone, iPad, Android, Windows Mobile, Xbox, PS3/4 etc, with crisp images and lossless audios.